Alto’s Adventure is an interactive piece of art that doesn’t revolutionize gaming, but does offer a charming experience with its endearing design and game-play. We’ve come really far with video gaming, and this goes beyond the ginormous graphical upheaval games have received, where the blocky humanoid figure of Lara Croft initially blew us away in 1995. We’ve not only revolutionized our games but our consoles as well: no longer must we limit ourselves to our living room couch to play a game, even ones with imagery that blows us away. When our mobile devices entered the age of smart technology, gaming naturally came along with it. Sure, Snake is fun, but the ability to play a fully-developed adventure game in 3D simply by whipping out your cell phone is incredible. Despite these technological advances, however, we realise there isn’t always a need to push our devices or our consoles to their limits. With enough creativity, good level design and style one can create a game that manages to grab our attention far more and earn a place in our heart because it stands out to us. (2015): a gorgeous, painterly piece of interactive art produced by a collaboration between Snowman and Harry Nesbitt. Alto is a young shepherd boy, one of a few snowboarders living in the snowy mountains with an understandable desire to shred the humongous slopes trailing down endlessly. The aim of the game is to catch the Llamas that Alto seems to always inexplicably lose control of, but the objectives you receive often have you focusing on everything but this. As you fly down procedurally-generating hills you’re given goals to allow you to level up, with a successful completion of all three current objectives moving you up another level. 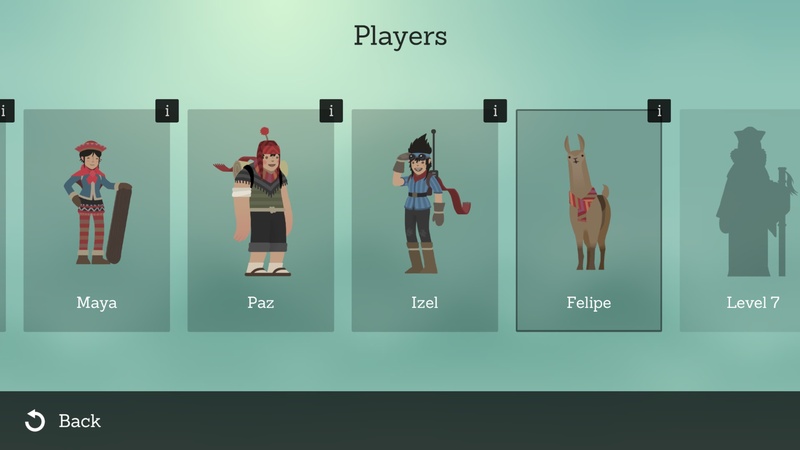 As you reach every 11th number you unlock another character, be it the fast-flipping Maya; the speedy, flame-shooting inventor, Izel; and even Felipe, a llama that just happens to know how to snowboard. But, it’s not so simple as collecting a certain amount of gold coins or performing a certain distance in grinding. Along the way you’re met with perilous chasms, rocks jutting out of the mountain along with the Elders; a group of guardians that watch over the mountain… when they’re not asleep. Since it’s an endless game there’s not really a way of beating it, but completing all 180 goals gets you an achievement on whatever device you’re playing it on, along with the satisfaction that you’re ~really cool, man~. Alto’s Adventure has been said to not have brought anything new to gaming, and while what its gameplay offers isn’t revolutionary that’s hardly a justification for such a statement. What Snowman and Harry Nesbitt have created is a game that takes traditional platforming and sports gaming and combined it with a glorious, minimalistic design to make something not only challenging but beautiful. As you careen down the mountain you’re met with an ever-changing day and night cycle, the sun and moon cropping up casting a gorgeous warmth or coolness across the dense forests and glistening snow. Akin to the UK, my home country, the weather never likes to stay the same either, but in Alto’s Adventure, it’s more than every five minutes. An outpour of rain or thunder and lightning suddenly casts into the sky, the mountains fixated in the faded background zapped with lightning. You can be hurtling down a slope as the sun emerges from the snow, a lush sunset radiating over the snowy ridges; or, the moon soon growing in full bloom as night falls across the mountains where archways and house windows cast a peaceful light, and lanterns float across the stars. I cannot help but describe “Alto’s Adventure” like a painting because it’s more than a game: it’s interactive art. It understands the need for a challenge in a game and presents it to you when needed, but it also rewards the player with new characters, items, and skills to make the game last longer. What’s more, the creators knew the game could be more than just avoiding obstacles and beating objectives: Zen mode lets the player just glide across the snow without any fear of a game over looming over their head. When you’ve got earphones, the soothing soundtrack and ambiance of the snowy region complete the picture, the wind chimes twinkling and the blustery air of the mountain top an incredibly relaxing soundtrack. All of these factors are what makes Alto’s Adventure one of my absolute favorite games, not just on a mobile device but on a console, as well: it combined excellent game design, gorgeous graphics, and simplicity into a journey that keeps you fully entertained throughout. It’s a game that can quickly pass the time, or it’s a game that can really take all of it if you focus on the many goals it offers you. It’s a game that challenges you, but also one that knows sometimes you don’t feel like overcoming anything and just need to wind down. It’s a game that knows that it doesn’t need to overload you with over-stimulating imagery and a vivid palette and instead utilize simplistic shapes, colors, and lighting to create something that looks exquisite. It’s won so many awards for a reason. Alto’s Adventure is a free-to-download game that doesn’t revolutionize gaming but does offer a charming experience that makes it entirely worthwhile, something you definitely should check out.